Spicy skirt steak and a BIG red! Vegans and vegetarians take note and be forewarned: I am an unabashed carnivore! Please understand that while I love veggies, fruit, grains and just about everything edible produced or grown on terra firma, I have a special fondness for seared, baked, fried, grilled or broiled animal flesh. And let’s not leave out those creatures that are caught, speared or netted from rivers, lakes and oceans- I love to knosh on them too. Among the plethora of meats and fish available, I must profess a special fondness for beef. Give me a piece of red meat and I’ll rub that sucker with loads of black pepper, garlic and a little Kosher salt, and then I will build a wood or charcoal fire so big it will create its own micro-climate. Next, I’ll roast the meat until the red inside just starts turning pink, and then I’ll wolf it down with a big, purple wine that will make your lips pucker and your heart sing (and continue to beat too). This dish needs a BIG red! According to my own medical consultant (Dr. Feelgood), wine, especially red, has properties that mitigate the rumored negative consequences of eating red meat on a regular basis. So there. And while there is nothing better in this whole wide world than any type of meat or even fish on a grill, I must admit (are you listening veggie lovers?) that I do enjoy things that are harvested from the soil, too, particularly the goodies I procure from local farmers at the Capitol Market here in Charleston. For the next six weeks, we will have the opportunity to choose from a cornucopia of the region’s most wonderful assortment of vegetables. I am particularly fond of peppers! Green ones, red ones and especially hot ones. I have prepared peppers in more ways than the normal person can fathom. I roast them, stuff them, fry them, freeze them, can them and, above all, I consume them almost daily. Here is a recipe for a dish I must give credit to my lovely bride for spicing up and improving on one she found in Bon Appetit Magazine a few years back. 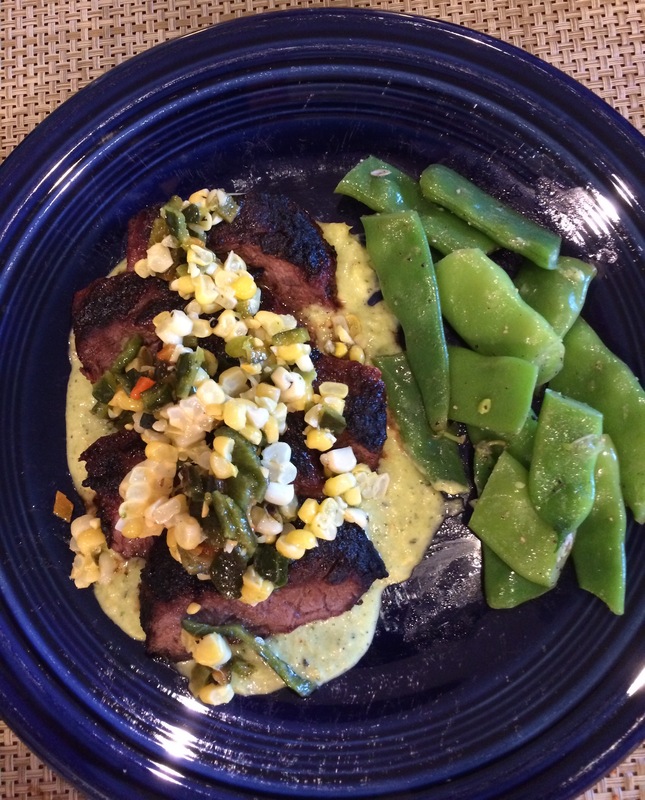 It combines three of my favorite foods: red meat, peppers and freshly picked corn. And you will need to pair this dish with a substantial red wine like the one suggested below. While I shop regularly at Johnnies Fresh Meat Market here in Charleston, the beef for this recipe hails from the Monroe Farm Market (www.localfoodmarketplace.com/monroe/). These good folks from Monroe County deliver produce and grass fed, freshly butchered meat weekly to Charleston. Incidentally, Johnnies also has a good selection grass fed beef too. This recipe calls for skirt steak, but you could also use thinly cut flank steak. You will want to pair this dish with a full-bodied red wine and, as luck would have it, I had the pleasure of meeting a very accomplished Napa Valley wine maker who was visiting Charleston a few weeks back. 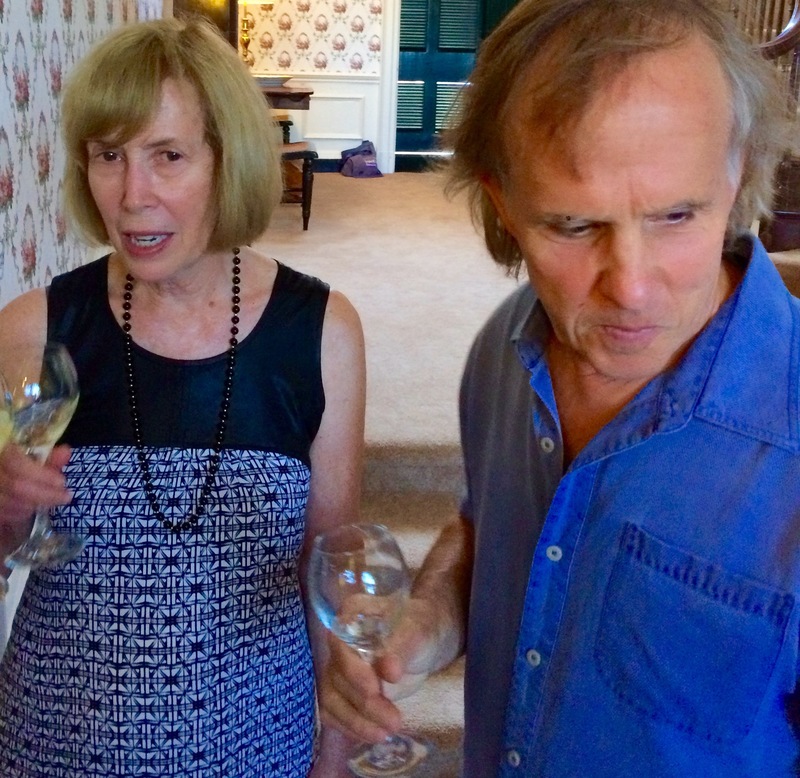 Peter Franus and his wife Deanne were in town to join chef Richard Arbaugh in hosting a dinner featuring Franus’ wines at South Hills Market & Cafe. While I really enjoyed the 2014 Franus Albarino and 2013 Sauvignon Blanc (both in the $26 to $28 price range), the 2012 Franus Zinfandel Brandlin Vineyard ($45) is the wine to use with the recipe below. Ripe, rich, blackberry and spicy teaberry flavors combine with the full-bodied, moderately tannic texture to make this the perfect accompaniment to the Spicy Skirt Steak recipe.